It was a colorful weekend in our household, as Tess and Jim earned purple qualifying ribbons in three runs in NADAC agility, along with two first place and a second place and her Novice Standard and Novice Touch N Go titles. In the meantime, Jazz and I were busy at the Rally Obedience trial, earning her very first qualifying score and second place yesterday...and doing it again today! Jazz was actually tied for first place today with a score of 99, but the tiebreaker is the amount of time in which you completed the course, and Jazz and I were a bit slower than the first place team. I was thrilled with how much we improved our score over yesterday on a course that was more difficult, too! It was quite the weekend here, with beautiful warm weather and success in both the agility and rally rings for Tess and Jazz. Who could ask for more?! I'm very proud to announce that Jazz received her first-ever qualifying score this afternoon!! Jazz earned a second place Q in Rally Novice A at the Butler Dog Training Association trial. I am especially pleased with Jazz's performance because of her tender age (almost 17 mos.) and because this is the first time Jazz and I have stepped into the rally ring. While we were both a bit tentative, we scored an 89 out of 100, with the first place dog scoring a 94 (70 points were needed to qualify). Not too shabby for a couple of amateurs! As we both become more confident, I hope that Jazz continues to enjoy Rally. It was a great way for the two of us to begin working as a team. Here's the video from our run. Overall, Jazz did great. We had a few shaky areas, but I'm hoping that a little experience and confidence for both of us will improve on our performance. Before today's trial, Jazz and I had the grand total experience of a 1/2 day Rally seminar under our belts and not much more than that! As I was getting ready for work this morning, I went to let the girls out and found Jazz lying across the back of the couch like she was a cat! I've never seen her do this before, and we don't have a cat who would have taught her this, but she was happily stretched across the back of the couch soaking up sunshine and watching the birds in our yard. Talk about a rough life!! I'm not going to worry about it unless Jazz starts to "meow" instead of "woof"! 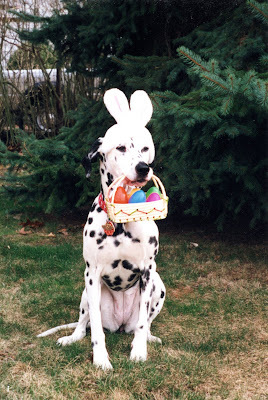 Lest you all think that Tess and Jazz are the only ones to endure my holiday photos, here's a picture of our first Dal, Dottie, from Easter 1999. Dottie would have been 11 years old then. She was with us for nearly 16 years. After losing Dottie in 2004 and our second Dalmatian, Tigger, just a year later, I thought I'd never let another dog into my heart...until I met a sweet little Dal named Tess. The rest is history! I cherish the memories of Dottie and Tigger and hold them close in my heart. I miss them every day and am grateful for all they taught me about being a good dog owner. I've decided that, from time to time, I'm going to pull out some of those old photos and share them here, as Tess and Jazz are partially the product of all the adventures and experiences we had with our beloved Dottie and Tigger. I hope they are smiling down on us from the Rainbow Bridge! We're at an agility trial in Morgantown, WV, this weekend, so the girls will have to wait until we get home to enjoy the yummy treats the Easter Bunny brought them. We're so proud of Tess, who had another great weekend at USDAA agility, with four first place qualifying scores, a third place, and her Performance I Standard, Performance Dog I, and Performance II Snooker titles! More important to Tess than all those ribbons, she also received a fun birthday gift from her favorite Aunt Mariann and Uncle Jim! Tess had almost as much fun tearing up the gift wrap as she did with the toy inside! 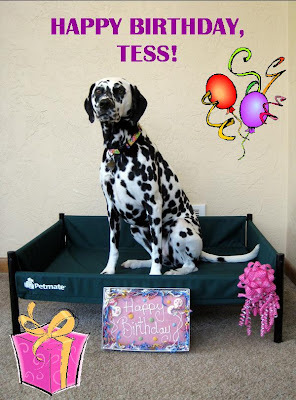 Today, we are celebrating Tess' birthday. Hard to believe she's four already! Tess is trying out the new doggie couch she got for her birthday. Tess checks out her birthday cake. Here's the birthday girl with her special doggie cake. Jazz decides that birthdays are a great thing, as she helps Tess eat her cake! Happy Birthday to our wonderful Tess...and many more!